“Sugar and spice and everything nice, that’s what little girls are made of.” Since baby Kairis was born during the winter season, I thought that would be fun to include many snowy and cozy themes for her newborn session. When doing newborn sessions, I like to add fun backdrops, props, and outfits that portray a little of the family’s personality as well as the time of year that their bundle of joy arrived. For this winter baby, snow covered the ground during her session, so I created the snowy log scene for them. I have a feeling that Kairis will love seeing these photos and hearing about her story as she gets older—I want to give her a glimpse of her beginning as a newborn surrounded by love and warmth. Mom and Dad are fitness buffs, so they wanted a photo of Kairis “holding” a hand weight. It turned out so cute—it looks like she worked so hard she fell asleep (don’t worry, sweet girl, I feel that way after lifting weights, too!) She was just so precious and slept soundly throughout her entire session. What a beauty she is! We even got a little sleepy smile in there. I couldn’t help but think that the classic photos of her wrapped in a pink swaddling blanket and floral headband would look so pretty on a birth announcement! Kairis’ parents wanted the session to be all about their baby girl, but I was able to convince Dad at the end to do one last photograph of his daughter sleeping in his hands. At just twelve days old, I would say that this special little girl nailed her very first photo shoot. She was such a pleasure to photograph, and I just wanted to sneak in a few newborn snuggles in between sets. Welcome to the world, princess! I can’t wait to watch you grow. If you would like to have really creative and beautiful photographs created of your newborn, contact me today. 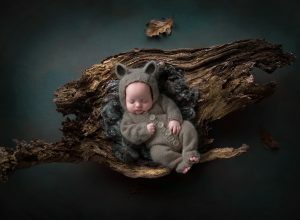 I am the only photographer in Connecticut that specializes in composite newborn photography.